Remember last week’s study that found congestion pricing could meet lots of environmental, equity, and congestion goals for the Westside? That study that several Westside interests criticized? There’s more to it than just the Westside. Road pricing is already working in other parts of the world – from Singapore to London to Stockholm. Since last week’s study came out, New York finally approved congestion pricing for lower Manhattan. That took over a decade of advocacy. Many other big cities are considering congestion charges; these places include San Francisco, Seattle and Philadelphia. Metro is studying congestion pricing, but before any sort of pilot would get approval plenty of naysayers will need to be convinced of its worth. For folks not at all familiar with congestion pricing or cordons, perhaps start with this TED Talk telling Stockholm’s story. Corridor – L.A. already has a version of corridor congestion pricing in its freeway ExpressLanes on the 10 and 110 Freeways. Express lane tolls are higher at peak hours; lower at un-congested times. Toll revenue goes to strengthening alternatives to driving, including improved Metro Silver Line bus service. Metro is studying a more robust version of corridor pricing where pricing would apply to all lanes and revenues would go to subsidizing transit service in the corridor. Cordon – Cordon pricing, such as in Stockholm, defines a boundary around a destination area, then charges drivers to cross that boundary. More on this below. Mileage – New VMT (vehicle miles traveled) charges, such as a Mileage-Based User Fee as California and Oregon have piloted, could charge higher for mileage at congested times and in congested places. Indirect – There are several ways that other fees and prices serve as a partial indirect proxy for congestion charges. These include pricing driving through parking costs, ride-hail fees, gas tax, etc. Where these prices are kept artificially low, driving is encouraged and congestion typically follows. Depending on how these sorts of fees are set up, they can encourage different transportation behaviors. That recent Mobility Go Zone & Pricing Feasibility Study (full pdf) was conducted by the Southern California Association of Governments. SCAG does transportation planning for a six-county regional area. Their recent study specifically looked at cordon congestion pricing. Cordon pricing certainly works in many places around the world. But, in addition to the political unpopularity that congestion pricing faces prior to implementation all over, cordon pricing faces some additional challenges in Southern California. Unlike Manhattan, San Francisco, and Stockholm, Southern California does not have natural cordon boundaries. Cordons are easier to conceive of when there are natural boundaries being crossed, such as bridges leading onto island. 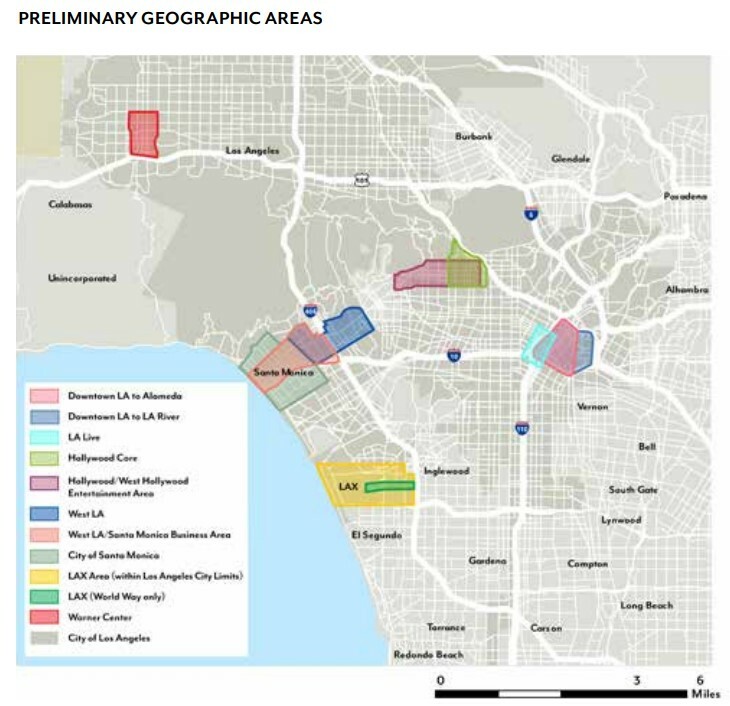 Southern California is said to be polycentric, with downtown L.A. being one important regional employment center among many. So it is not quite obvious exactly where a cordon would work best. Another tricky caveat in selecting boundaries is the complexity of overlapping jurisdictions. Roads are governed mostly by underlying municipalities, mostly cities. Freeways running through cities are mostly governed by the state, with some federal oversight. Drivers are, of course, not particularly concerned when their commute takes them from a city street to a state highway, but pricing one of these and not the other could have consequences in pushing congestion around instead of reducing it. Multi-jurisdiction projects would require approvals at multiple levels. L.A. cordon pricing could potentially need approvals from multiple cities, as well as county, Metro, state, and federal governments. Multi-jurisdiction revenue also likely means a political struggle to determine who gets funding for what. SCAG specfically studied cordons for “geographic areas involved experiencing congestion on arterial roadways, as opposed to highways.” This unfortunately sounds like the proverbial drunkard searching in the wrong place. Can Southern California make significant progress on reducing car congestion without looking at freeways? SCAG does have other studies and plans that outline ExpressLanes for tolling some highway travel. SCAG looked at eleven potential cordons. It recommended five cordons for further study and recommended against six other proposed cordons. Readers – what do you think? 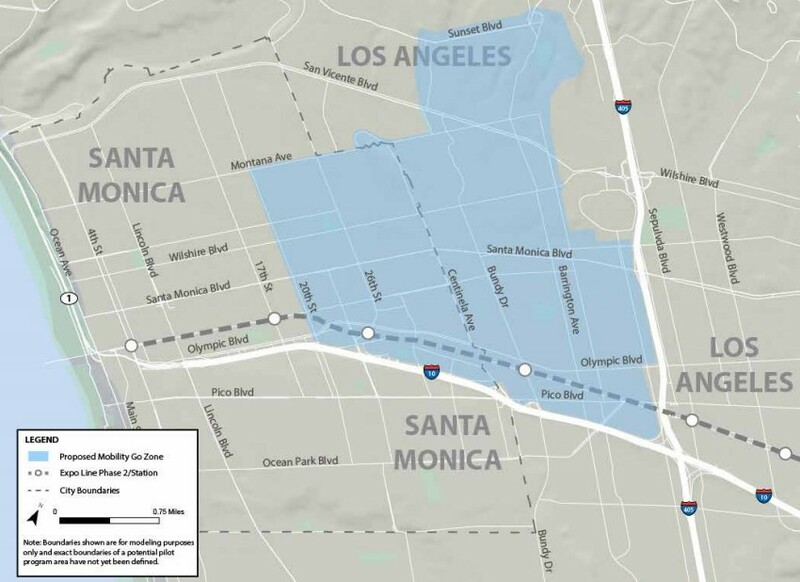 Where would you draw the boundary line for a congestion pricing cordon in Southern California? What boundaries make the most sense? And ultimately how do those boundaries affect not only congestion – but how can a Southern California cordon congestion pricing program best foster equity? Congestion pricing cuts two ways for low income Angelenos. Low income transit riders would see big benefits including better service and lower (potentially free) fares; low income drivers would see their transportation costs increase. The SCAG report calls for a discount program, similar to Metro ExpressLanes Low-Income Assistance Plan, which is not defined in detail, though the report suggests charging eligible low income drivers 50% of what other drivers pay. Given the costs and benefits, it will be important to design a congestion pricing program so that its benefits go to low income people and neighborhoods and not just well-off ones. They should just charge for using certain 405 and 10 offramps from 6 AM to 10 PM. I wonder if a system of cordon pricing could, instead of drawing boundaries around particular neighborhoods or local centers, make the charges apply to cross major thoroughfares, sort of like a long fence. I think this would work particularly well for streets that run North/South nearly the entirety of LA: Lincoln, Sepulveda, La Cienega, La Brea, Western, Vermont, etc. If you only charged the freeway offramps, you’d just push motorists onto the surface streets. West LA and the DTLA Core (including the freeway ring) should happen like yesterday. Why not a larger Cordon? Something roughly bounded by the ocean, the Santa Monica mountains, the 5, the 10. West of the 405 and north of Rosecrans also included. The boundary would have to be wide, such that someone wouldn’t get penalized/charged for living on/near the boundary or traveling just a few feet into it. I wondered about that – my mental boundary to L.A.’s dense-ish core is a few miles above and below Wilshire – DTLA, Hollywood, West L.A., Santa Monica. (I read something somewhere that identified this as the L.A. region’s actual core.) The question with a big area like this would be how well cordon pricing would work if it generates a lot of the trips within itself. I suspect there are not THAT many trips generated within the core, although with a million people obviously there are going to be hundreds of thousands total. My thinking is extend it in a rough block where parking is scare and not free. People who live there and pay for parking inside the cordon who make trips also have to pay for parking at the end of their trip and they roughly get a pass. You would have to ensure ride-hailing and taxis have to pay the fee even if the trip originates and ends inside the cordon, but that is not hard. As I said a wide ‘double cordon’ In South LA the first might actually be Expo Blvd, the next might be MLK the second Washington Blvd. Only a trip that starts south of MLK and ends North of Washington would pay the congestion fee. And only at peak times. Similarly along the Santa Monica Mountains, the Cordon wouldn’t be Muholland Dr, it would be Ventura and Sunset. Only trips starting north of Ventura and ending South of Sunset during peak times would pay. A new video shows UCLA research on why transit has declined, and what can be done to bring it back.